Luther: "When in his frailty, a man invokes the saints, he invokes Christ, and without fail he will reach Christ whenever he calls upon their name"
"When in his frailty, a man invokes the saints, he invokes Christ, and without fail he will reach Christ whenever he calls upon their names, for wherever they are, they are in Christ and Christ is in them, and their name in Christ's name and Christ's name in their name." Most of the relevant hits you'll get on this one are back to the Tiber Jumper blog (and a few others citing it without a reference). The Tiber Jumper blog uses it for an "All Saints Day" post: "All Christendom since the first century after the disciples have taken advantage of the intercession afforded them through the martyrs and saints who have gone before them and the earliest recorded date of a worldwide remembrance of all saints day is recorded in 373 AD. Even Luther had this to say regarding the communion of saints", and then follows the mystery Luther quote. I beseech in Christ that your preachers forbear entering upon questions concerning the saints in heaven and the deceased, and I ask you to turn the attention of people away from these matters in view of the fact…that they are neither profitable nor necessary for salvation. This is also reason why God decided not to let us know anything about His dealings with the deceased. Surely he is not committing a sin who does not call upon any saint but only clings firmly to the one mediator, Jesus Christ [Martin Luther, “Letter to Erfurt evangelists July 10, 1522,” What Luther Says, Vol. III, 1253]. It took me awhile to track this mystery quote down. It was this citation from What Luther Says that intrigued me about the quote and if whether or not it was from the same context. Plass also states, "A few paragraphs later Luther says: 'Let them [the weak] call upon the names of the saints if they are bent on it, but under the condition (so fern) that they know how to guard themselves against lacing their trust and confidence in any saint. They must trust only in Christ' " (Ibid.). The thought about "the weak" was similar to the mystery Tiber Jumper quote. He had still, in the year 1519, spoken in unquestioning simplicity of the Invocation of the Saints, although he had already exposed the fallacy of the Catholic theory as to the meritoriousness of such prayers, and refused to give any countenance to the canonization of saints. As late as the year 15 21, when undertaking to expound the Magnificat, he, in the same spirit in which it was customary, in the sermons of the day, to interject the Ave Maria as an ejaculatory prayer, expresses the devout wish: "Would that the same tender Mother of God might secure for me the spirit to properly and thoroughly expound this her song," etc. Yet, in this very work, he applauds especially the humility of the holy Virgin. She does not herself desire that we should honor her or expect to receive good from her. Only God should be praised in her. Although we are permitted to call her the Queen of Heaven, yet she is not a goddess, to bestow gifts or help. She gives nothing, but God alone gives. The Sermon in the Church Postils upon the Epistle for the Second Sunday in Advent shows us further the path by which he advanced to a total rejection of saint-worship. He here avails himself (though in the Latin postil he had not yet done so) of the words of the apostle glorifying the Father of our Lord Jesus Christ, to emphasize a warning against any worshiping of saints in which the worshiper does not press on into the presence of God Himself. He is filled with anxiety lest an abominable idolatry may by such means be introduced. He grants that some employ the worship of saints and of the Mother of God in a proper spirit. Nevertheless, it seems to him to be a dangerous custom, which should not be observed in the general congregation. Though there were nothing wrong in the practice otherwise, it seems to him at the outset, a suspicious circumstance that it has the support of no scriptural text or example, but that it rather contradicts those passages which teach us to place all our confidence in God. With reference to the miracles, which were commonly adduced in support of the custom, and which he had still acknowledged in his Unferricht auf etliche Artikel, etc.,' he now declares, that we are to build, not upon these, but only upon the doctrine of Christ; and that the miracles in question may have been wrought upon the saint-worshipers by the devil himself." Luther, therefore, accords at once in principle with the Wittenberg agitators, who wished to have saint-worship entirely abandoned. He fears it more than the worship of images, which was at most but a rare occurrence. He wishes here too, however, first to see only such an efficient use of the Word as may set free the consciences of men. It would have been his desire, indeed, that this question might be allowed to rest for a while, since its agitation was not a pressing necessity, and Satan was already trying by useless questions to draw the attention of men away from faith and love. If it be only once established that saint-worship is nothing, it will fall into disuse without any special additional effort upon our part, and Christ will then remain alone upon Tabor. This, says Luther, was his own experience ; he does not know how nor when he ceased to address prayers to the saints, contenting himself with the one Christ and God the Father. In harmony with this is the advice given in 1522 to the Christians at Erfurt, among whom a dispute had been occasioned by "certain sermons upon unnecessary things, namely, upon the worship of saints." He writes to them that, although it is not necessary to honor the saints (that is, by invoking them), he yet does not think that one who does so should be condemned, if he only do not place his confidence in them, since what such a one does to them is done to Christ, because Christ is in them and they in Christ. We should, therefore, bear with the weak. We must, at any rate, all at last forsake the saints and ourselves, to know nothing but of Christ, and let all else go.' But when the evangelical teaching, which by its very nature could lend no sanction to saint-worship, had become thoroughly established in preaching and in the life of the people, and when, upon the other hand, such worship was cultivated but the more assiduously by the adversaries of the Gospel, Luther finally announced, as his position and advice, an entire and absolute rejection of the practice. It is true, he still, in a Sermon upon the Day of John the Baptist (June 24), which he also included unaltered in his Postils, granted that one might say to such a saint as Peter, " Pray for me," and only advised that it would be better to address one's self to Christ alone, inasmuch as the Scriptures say nothing about such a prayer as the one mentioned, and we are only thereby led into a whole series of fruitless and improper questions concerning the condition of departed saints. But in the year 1523, he expresses his decided approbation of the Bohemian Brethren for their course in not calling upon saints at all, but resting content in Christ. It was probably in the same year that he advised Urban Rhegius at Augsburg to abandon the worship of saints, because it was an uncertain thing, and we should confine ourselves to that which is certain. He gives this advice when sending to his friend a sermon of Carlstadt upon the intercession of Mary (which appeared in 1523), in which the latter had declared the invocation of Mary to be not only unnecessary, but "not good."' Moreover, he insisted that the invocation of the saints should no longer find a place in the regulations or hymns of the Church.' The opinion that, according to I.k. xvi. 9, the saints may " receive us into everlasting habitations" is combated expressly, in 1522, in a sermon preserved in the Church Postils, It is, he maintains, the poor living with us upon the earth who are there spoken of, who are standing witnesses of the faith which we have manifested in our treatment of them. We are to serve them, and in general all our fellowmen upon earth. The saints require no service upon our part, no foundations, etc. As to Karlsladt and Gabriel Didymus, who had occasioned the Wittenberg disturbances, it must be remarked that the latter had retraced his steps and become a different man, concerning Karlstadt, however, it was not known what he would do. He felt himself aggrieved that Luther had set aside his regulations, though the latter had not rejected his doctrines, having only declared his dissatisfaction that Karlstadt had busied himself wholly with ceremonies and outward things, and on account of these had neglected the true Christian doctrine concerning faith and love. Luther was now only concerned that they might imitate the Wittenberg tumult at Erfurt, in the removal of the images, the abolition of the mass, of one kind in the sacrament, and all the other matters. He accordingly repeatedly wrote to John Lange, and it being especially the invocation of the saints about which they were at variance at Erfurt, he drew up the writing: "Concerning the Saints. An epistle or instruction to the Church at Erfurt, assembled in God." In it he exhorts the ministers to avoid the questions concerning the saints in heaven and concerning the dead, and to draw the people off from them, because there would be no end to questions here. That it was the object of Satan to detain them with that which is unnecessary, in order thus to hinder that which is necessary. That he did no sin who did not invoke the saints, but relied firmly upon the only Mediator, Jesus Christ, yea, that such a one was perfectly right and secure. That the others, however, should not be despised in their weakness. "Let them call upon the name of the saints if they will do so, only let them know and be on their guard that they do not put their confidence and trust in any saint but alone in Christ. For confidence is the highest honour which is due to God alone, who is the truth himself." He in particular warns them against insurrection, saying: "There are many inconsiderate men who imagine themselves able to help the cause of the Gospel by means of the sword and the arm of flesh, thinking to have attained their object if they weaken or injure priests and monks. But they do not know that our warfare is not against flesh and blood, but against the wicked spirits of the air. (2 Cor. x. 3, 4.) Satan is a spirit, having neither flesh nor bone, wherefore iron and an arm of flesh will accomplish nothing. The hearts of men must first be torn from his grasp by means of the Word of truth; that is our sword and might which no one can resist: with it the friends of Christ divide Behemoth and cut him asunder. Behold wherewith I defeated the papacy and the spiritual power, which before was a terror to all the world, when all men acknowledged: Who can prevail against the beast? For it had power to make war even upon the saints, and to overcome them. (Rev. xiii. 4, 7.) Yet I never raised a finger against it, and Christ has destroyed it with the sword of his mouth." (2 Thess. ii. 8.) Finally, he adds: "I fear, too, that much of all the evil is owing to ourselves, because we preach a great deal of our inability to do anything without the grace of God, and yet attempt to begin and to accomplish all manner of things of ourselves, without first, in humble prayer, beseeching God that he would begin and accomplish them through His Spirit. Thus it happens then, that we journey to Egypt, and begin the work in obedience to our own spirit, never first asking at His mouth concerning it. Therefore, my dear friends, let us act as we teach, committing all things to God, and without ceasing praying Him to direct us, to counsel and to help us, both in great and small matters, and not to permit us to follow our own opinion and reason in beginning anything." The quote in question comes from a transitional writing from Luther. Therefore, citing it as a support text for invoking the saints is unjustified. Ken's recent post and a few helpful links from my cyber-pal Algo have combined to prompt me to provide a link to Eric Svendsen's debate on authority. When I first began studying Roman Catholic issues, I was fortunate enough to come across Eric Svendsen's Ntrmin.org website. I haven't heard this debate (or if I did, I don't recall it), nor have I kept up with Eric. I look forward to checking it out. 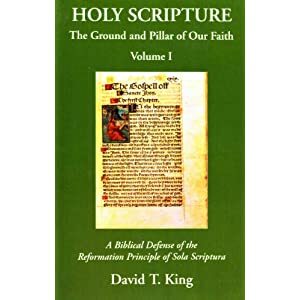 Mitch Pacwa argues the Roman Catholic position (amounting to sola ecclesia), while Eric Svendsen argues the Protestant position (sola scriptura). This debate took place in Oklahoma City on May 2007. 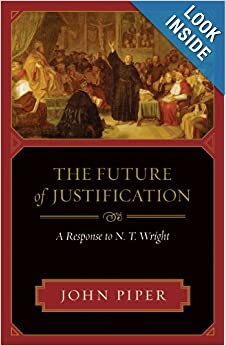 By no means exhaustive, but here is an introductory list of good books and articles on the subject of the Reformation doctrine of Justification by Faith alone, in Christ alone, apart from the merit and condition of good works. We must always also remember that, "We are justified by faith alone, but true faith never stays alone"; it grows and results in good works and fruit and deeper levels of repentance and change as we grow spiritually. These are books and articles and sermons that have been helpful to me. Nick Needham has a chapter in this book (above) on "Justification in the Early Church Fathers"
David Wright has a chapter on "Justification in Augustine"
Anthony Lane has a chapter on the Regensburg attempt for RCs and Protestants to solve their differences over Justification (1541) and Trent's unfortunate dogmatic response. (1546-1547) Entitled, "A Tale of Two Cities: Justification at Regensburg and Trent"
and many other helpful chapters! All the above are helpful to study and imbibe deeply; and the last two were very helpful in counteracting some of the typical Roman Catholic criticisms of the doctrine of justification by faith alone. According to this website, in 2008 there were 184 million blogs. Have you ever thought honestly about why you have a blog? Is your blog a hobby, or just a fun and frivolous endeavour? Is it something you take seriously as your "ministry"? Do you think you have theological, apologetic, or personal insights the world needs to hear? "I'm concerned at the number of re-posting old posts going on lately, as if there is nothing new to write about. To me, posts like these don't help either side because they're based on opinion rather than fact." "I want to see some posts where you personally have defended or demonstrated the truth of Sola Scriptura, Sola Fide, Soteriology, Ecclesiology, Sacrametns, etc. Just posting quotes about what Luther said or what this or that Catholic apologist said isn't the same as making a theological argument and defending it." I started this blog late December 2005. I did so because I had spent the previous five years or so interacting with people on discussion boards. I started out on various boards discussing and defending Reformed theology. Then I became interested in interacting with the claims of Roman Catholicism. It wasn't too long before I noticed Roman Catholics negatively citing Luther or Calvin as part of their argumentation. I can actually recall the very first Roman Catholic-cited Martin Luther quote I looked up. 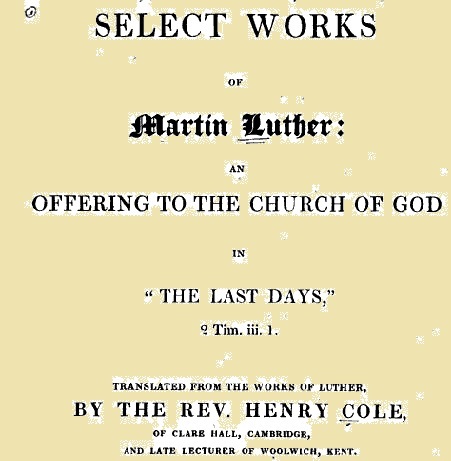 I had exactly one volume of Luther's Works. I was amazed at what was cited and what was actually said. From there, I became intrigued about the contexts of the outrageous Reformation quotes Roman Catholics were so freely dishing out. I discovered quite quickly that the contexts and historical explanations for the outrageous Reformation quotes weren't always so easy to come by. Once I began tracking down the pertinent information and posting it in dialog, the discussions changed. It became fairly easy to shut down someone defending Romanism in regard to Reformation history. I discovered that more often than not, Rome's cyber-zealots hadn't even read the actual contexts of the quotes they were citing. Probably some of you have had the very same experience I've had: you've spent hours composing a response or a discussion post, only to have it eventually disappear. Or, you've written something on a discussion board, and then months later you couldn't find it. That's enough to provoke anyone to start a blog. That's a condensed version of what happened to me. I originally simply wanted somewhere to keep the information I had been compiling which I could link to quickly. I entitled the blog "Beggars All Reformation and Apologetics" because the emphasis of the blog was (and still is) on Reformation research. As far as I can tell, there aren't that many blogs out there that do what I do. So when someone says "Just posting quotes about what Luther said or what this or that Catholic apologist said isn't the same as making a theological argument and defending it" they've apparently missed exactly why I "do" this blog. I haven't limited myself to looking up Luther quotes, but I certainly have focused on it. Rome's apologists have provided enough material to keep me busy for years if I so choose. As I surf through cyber-space there are a multitude of people (both Protestant and Roman Catholic) offering their opinions on "Sola Scriptura, Sola Fide, Soteriology, Ecclesiology, Sacraments". In fact, it's a cacophony of voices. I choose (usually) to not be one of those voices. I'm enjoying doing something a lot less popular. Luther's "Fit in the Choir"
That's what one of my critics recently said in regard to my opinion on Luther's alleged "fit in the choir." In actuality, as I searched through my blog, it appears I've rarely mentioned this myth on this blog, and only in passing (for instance: 5/02/06; 6/04/06; 6/06/06; 7/17/07). The irony of this Roman Catholic critic is his shying away from the original Roman Catholic interpretations of Luther's "fit in the choir" as demon possession favoring instead modern secular psychological interpretations. The story that Luther had a fit during Mass, while the story of the epileptic boy was being read, is more than dubious. It comes to us from four catholic writers: Nathin, Dungersheim, Cochlaeus,Oldecop, all of whom were his enemies, all of whom believed that he was possessed by a demon. An examination of these sources shows that they are not four separate accounts but each is repeating the other, as W. S. Gilbert would say, adding a few corroborative details intended to give an air of artistic verisimilitude to an otherwise bald and unconvincing narrative. Such is Cochlaeus’s addition of the cry ’ I am not’. [Gordon Rupp, John Osborne and the Historical Luther, The Expository Times 1962; 73; 148). When this story was first told by Luther's detractors the goal was to prove Luther was possessed by a demon. Cochlaeus believed Luther was a child of the devil, the fruit of a union between Satan and Luther's mother (who later regretted not having murdered him in the cradle). Luther's life was characterized as a man who lusts after wine and women, is without conscience, and approves any means to gain his end. Luther was a liar and a hypocrite, cowardly and quarrelsome. Demonic monstrosities boiled out of Luther’s powerful perverted mind. At Luther's death, Satan came to drag him off to hell [source]. Fast forward a few hundred years and Luther's secular interpreters gravitate towards this tale in their probings into Luther's psyche. The most famous of all the psychohistorical approaches to Luther was Erik Erikson's Young Man Luther (1958). This is the favored interpreter of my Roman Catholic critic (see here, here, and here). If some of it is legend, so be it; the making of legend is as much part of the scholarly rewriting of history as it is part of the original facts used in the work of scholars. We are thus obliged to accept half-legend as half-history,provided only that a reported episode does not contradict other well-established facts; persists in having a ring of truth; and yields a meaning consistent with psychological theory" (Young Man Luther, p. 37). What's also fascinating is that my Roman Catholic critic also grants the story is not an "undisputed fact." For this person though, "the fit in the choir is more than likely" because it is consistent with Luther's behavior in the monastery "like six hour confessions, extreme self mortification, obsession with the devil, and being found unconscious from fasting" and "some of Luther’s brother monks thought him to be either insane or demon possessed and that fact is entirely consistent with the 'fit'." This is the level to which some Roman Catholics will go: if it sounds like it could be true, then it probably is. That's certainly a far cry from "to be deep in history is to cease being Protestant." Rupp points out "This story is in fact the only kind of evidence that Luther ever had such attacks. There is no trace of epilepsy before or after. Psychosomatic attacks show themselves in his forties, 1527-1528, but they are connected with his heart, dizziness,palpitations, and fainting fits" (Rupp, 148). 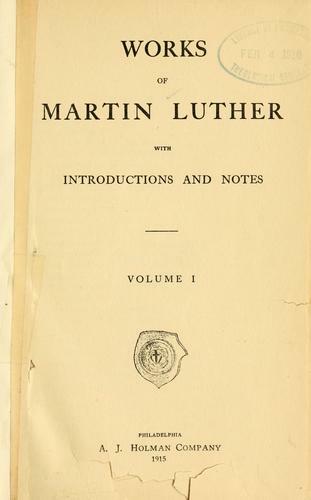 Roman Catholic scholar Franz Posset states that in the monastery "Luther was not a loner or a constantly depressed introvert" (The Real Luther, p. 94). Indeed, Luther did claim "I was a good monk, and I kept the rule of my order so strictly that I may say that if ever a monk got to heaven by his monkery it was I. All my brothers in the monastery who knew me will bear me out. If I had kept on any longer, I should have killed myself with vigils, prayers, reading, and other work." My Roman Catholic critic thinks Luther's behavior in the monastery was abnormal for a 16th century monk. I would rather argue Luther was being a consistent Romanist. Let's play in a Roman Catholic reality for a moment: If Luther was abnormal according to my Romanist critic, so was Pope John Paul II with his penitential practices and self-mortification (for example, the use of hair shirts). Interestingly my critic quotes Erikson's overview of other psychological interpreters of the choir fit, but neglects to point out that each of these interpreters (Denifle, Reiter, Smith) arrived at a different conclusion about this alleged story. Erikson actually catches Reiter changing the story from Luther saying "That's me!" to "That's not me!" (Erikson, pp. 27-28). 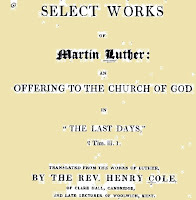 Men like Denifle, Smith, Reiter, or Erikson did use, in a sense, a similar approach in trying to understand Luther, but none of them arrive at the same conclusions, or even minimize or maximize similar conclusions. To simply lump them all together is the way of propaganda. My critic can claim that my presentations of Luther are sanitized and present a distorted image of a historical personage. But above you'll notice my method for arriving at the conclusions I do about the choir fit story. The above would be the same sort of scrutiny I would use on any historical person. Phil Johnson reminds us that Truly giving thanks to God will kill a lot of sins and wasting of time. Dr. White on the Dividing Line on Tuesday, November 22, reminded us of the real reason to be thankful. By working diligently through Philippians 2:1-11, we see the greatness of the incarnation and the humility of the eternal Son, the equality He had with God the Father, and the equality believers have with each other and so are called to humble ourselves and serve one another in love. 1. The context of church unity (Phil. 2:1-4) and love and the equality of the believers and the exhortation to be humble and serve one another in verses 1-4 is key to interpreting verses 5-11 properly. Since the believers are equal, then the Son and the Father are equal, otherwise the passage would not make sense in the command to humility in verses 1-4 by illustrating it by the humility of the Son, since He was equal with the Father. 2. The parallel between the humility of the believers to one another in verses 1-4 and the humility of Jesus to the Father, in verses 5-8. (in humility consider one another more important than yourselves” (vs. 3) and “He did not consider equality with God the Father a thing to be held on to” (v. 6). “that is not humility, that is just not committing blasphemy”. 3. The Greek word, ‘εαυτου, "himself”, a reflexive pronoun, that is used twice – verses 7-8 – “He emptied Himself”; “He humbled Himself” – that the eternal Son who existed in the form of God, humbled Himself and emptied Himself, becoming a man – this is amazing love and an amazing message and truth. The incarnation; the crucifixion; - I stand in awe and amazement! Dr. White’s reminder to believers to be thankful for the ‘εαυτου (he-autou) was a good exhortation for the celebration of the thanksgiving holidays. Be thankful for the true God, the eternal Son, the eternal Word, who humbled Himself and became a man, and who humbled Himself and allowed Himself to be killed on a cross. “Not just any death, but a humiliating death, the lowest of the low kind of execution.” Wow! The emptying is a positive act of adding a human nature. He existed in the form (morphe- μορφη ) of God and took the form (μορφη – morphe) of a slave. "Why do you worship Jesus? The only answer the Unitarian can give is because God just tells them to." There is a direct parallel of the worship of Yahweh, the Lord, in Isaiah 45:21-23, with Jesus as Lord in Philippians 2:10-11." 21 “Declare and set forth your case; Indeed, let them consult together. Who has announced this from of old? Who has long since declared it? Is it not I, the LORD (Yahweh – יהוה ) ? And there is no other God besides Me, A righteous God and a Savior; There is none except Me. 22 “Turn to Me and be saved, all the ends of the earth; For I am God, and there is no other. 23 “I have sworn by Myself, The word has gone forth from My mouth in righteousness And will not turn back, That to Me every knee will bow, every tongue will swear allegiance. In Isaiah chapters 40-48 especially, the oneness of God is affirmed; monotheism. But also . . . The God of the Bible humbled Himself! Wow! God made Himself nothing in the incarnation and crucifixion – the real reason for thanksgiving is His condescension, His humility, His coming and giving Himself for us to save us. Lord, teach us to be grateful for these great blessings! And start with me! A Muslim asked "Why are Christians allowed to defend Christianity in a presuppositional way, but Muslims are not allowed to do the same? You can try to do so; but it is contradictory to logic, because Islam claims to be the fulfillment of the OT and NT and comes more than 5 Centuries after the NT events, and yet, contradicts the teachings of the Bible, therefore, Islam is proven wrong. Simple answer: Because Islam came almost 600 years later; yet contradicts the Bible in key areas. Because Islam has no historical evidence to back up its claims that it is a fulfillment of the OT and NT; yet claims to affirm the OT and the NT, and yet contradicts what the OT and NT teach. The Jews of the NT - Jesus and His disciples/apostles were steeped in the OT and quoted from it extensively. The Arabs and Muhammad did not quote from the OT (there is one allusion; Qur'an 5:45), and did not know much of the content of the NT, called the "Injeel" (a corrupted form of the word, "Evangel".) (except that it existed, and was the revelation/message of Jesus, and that Jesus had faithful disciples who were honest; and that Jesus was Al Masih (The Messiah), virgin born, and did miracles, and is the son of Mary. Jay Smith demonstrates that the Bible does not refer to Muhammad, the founder of Islam, even though the Muslims are forced to try to find him in the previous Scriptures, the Torah (The law of Moses; Arabic - Taurat تورات) and the Injeel انجیل (Gospel), because of 2 verses in the Qur'an. (Surah 7:157; Surah 61:6). See more in this series from Jay Smith, highlighted by AnsweringMuslims.com. "And [mention] when Jesus, the son of Mary, said, "O children of Israel, indeed I am the messenger of Allah to you confirming what came before me of the Torah and bringing good tidings of a messenger to come after me, whose name is Ahmad." But when he came to them with clear evidences, they said, "This is obvious magic." (Sahih International Version.) See here for the Arabic and English. 1. Deuteronomy 18:15 - this one is very clear in the immediate context of chapter 17 and 18, that the prophet who will come in the future will be a Jew, an Israelite. More NT fulfillment of Deut. 18:15 in Jesus. The context is so clear here, it should be embarrassing for Muslims to try and use this. Jesus fulfilled Deut. 18:15 in Acts 3:22. 2. Song of Solomon 5:16 - Jay did a good job of defeating that; the context, beginning in verse 10, is Solomon's bride/lover/wife in Jerusalem, talking about Solomon, her beloved. Dr. White also proved this Muslim apologetic method wrong some time ago. On the Greek word, "parakletos" in John 14:16-17; 14:26; and John 16:7, with 16:12-15, it helps to have a visual of the Greek word in question. παρακλητος - the true Greek word in the text. "helper", "counselor", "comforter"
περικλυτος - the word the Muslims claim was originally there in Greek. In order to Muslims to make it work, they have to change 3 key letters of the word. Jay Smith makes a great point that in Arabic, it is a consonantal language, the verbs are sounds in between the letters and most of the time, they are not even written. The Muslim apologists, many times, try to equate Greek with Arabic and say that the vowels in Greek could have been different. They are using an Arabic language characteristic and imposing it upon the Greek language. "I will ask the Father, and He will give you another Helper, that He may be with you forever; 17 that is the Spirit of truth, whom the world cannot receive, because it does not see Him or know Him, but you know Him because He abides with you and will be in you." "Helper" - is the translation of the Greek, παράκλητον - the accusative form (the accusative is the object of the verb "to give", and in Greek the accusative form changes the last letter in this word in order to show that it is the object of the verb) from παράκλητος (nominative, dictionary form). Reasons why it makes no sense for Muslims to use John 14 and 16 and the word "parakletos" to try and prove their apologetic. 1. There is no manuscript evidence and no textual variant of this word in John 14 or 16, so for Muslims to just make up the changes in the three letters is a massive problem, and many times downright deceptive. Parakletos means "the one called alongside" to help or comfort or advocate for; "the comforter", "the helper", "the counselor". The Greek word does not mean "praised one" or "glorious one". (I don't understand Jay Smith saying it means "glorious one", when "Ahmad" احمد (another form of Mohammad- محمد , "the praised one" - you can see the root, hmd, حمد , which means "praise" in Arabic.) in the Qur'an 61:6 means "praised one". 2. The parakletos is "the Spirit of truth" who will be in you. Obviously, this is about the Holy Spirit who would baptize believers and indwell the disciples and all believers (John 7:37-39). It cannot be about Muhammad, because Muhammad is in no sense "in" them. The fulfillment of this is clear in Acts chapter 2 and explained in John 7:37-39 and I Corinthians 6:19-20; 12:13, Galatians 4:6; Ephesians 1:13; 4:30 . It cannot be about Muhammad, who was a human coming almost 600 years later, he was not a spirit. 3. Muhammad does not "abide with them". 4. Muhammad cannot be with the disciples "forever". 5. Muhammad came into existence 570 years after the birth of Christ, so the promise makes so sense for the disciples of Jesus at all, much less for other Christians. 6. Muhammad is not a spirit, but a man. 7. Muhammad does not glorify Jesus in the way that the NT means. The Presupposition that the Bible is true and the God of the Bible is true conforms to reason and logic. A presupposition needs to make sense; and be in conformity to truth and not contradict evidence, or its own claims. Islam makes no logical sense, since it claims to be a third stage in revealed religions, and that Muhammad came to complete Judaism and Christianity. Islam makes no sense, since Muhammad cannot be the "parakletos", the Helper, the comforter of John 14 and 16. Islam makes no sense, since it affirms the OT and the NT (Surah 2:136; 5:46-48; 5:68; 10:94; 29:46); yet contradicts the content of those same Scriptures. And Islam makes no sense, because it flatly denies the crucifixion and death of Jesus (Surah 4:157); one of the most accepted historical facts of history; and something that even skeptic unbelievers like John Dominic Crossan and Bart Ehrman affirm as historical fact.